Create the destination wedding of your dreams at Beach Palace, with a friendly ambiance ideal for families, and spacious suites and family room options on offer. 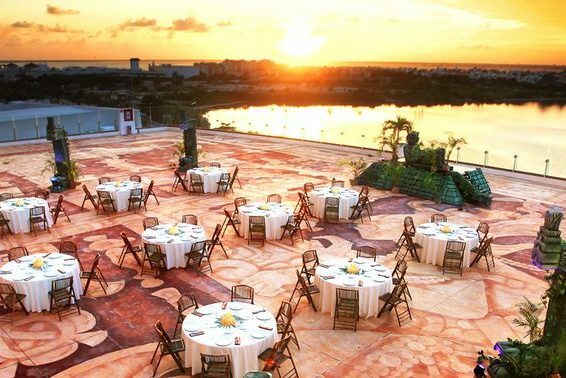 Before your wedding ceremony, you will have the leisurely choice of taking in the beauty of the Caribbean Sea or the Nichupte Lagoon as you lay under the sun together. Watch the postcard-worthy sunrises or sunsets from the comfort of your own private and fully-furnished balcony. 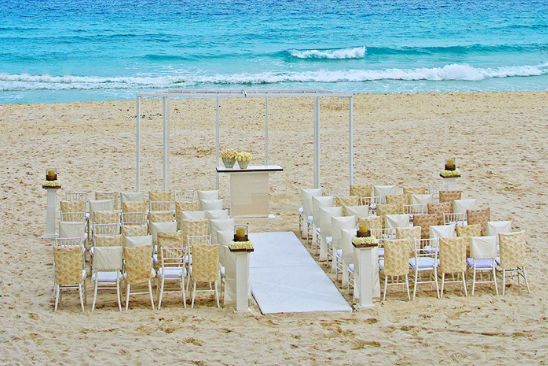 The flawless beaches, provided childcare, exotic tours, and exciting nightlife options, creates something unique for every one of your wedding guests! Feel at ease knowing the children are taken care of at the kids club and teens club, in addition to the new Telcel PTT (Push to Talk) service, which gives parents the ability to speak with their children at any time. All of the rooms at this resort offer luxury CHI hair products. This resort is best for those who want a quiet and laid-back family vacation with only 1 main pool and 1 main bar. Free one-hour private cocktail reception when you book 10 – 19 rooms. Free two-hour private function when you book 20 – 24 rooms. Free private event for up to 9 hours when you book 25 – 35 rooms. This wedding package is complimentary when you book a minimum of 14 total nights at the resort. Upgraded packages, additional guests, and add-ons are available for an additional cost. Rooms range from $220 – $270 per person per night. Every room includes wifi, a double whirlpool tub, and in-room wine upon arrival for adults. Guests looking for utime luxury will enjoy the Concierge Level room that includes two 25-minute massages and a private beach lounge area with waiter service. Children 3 and younger stay free. 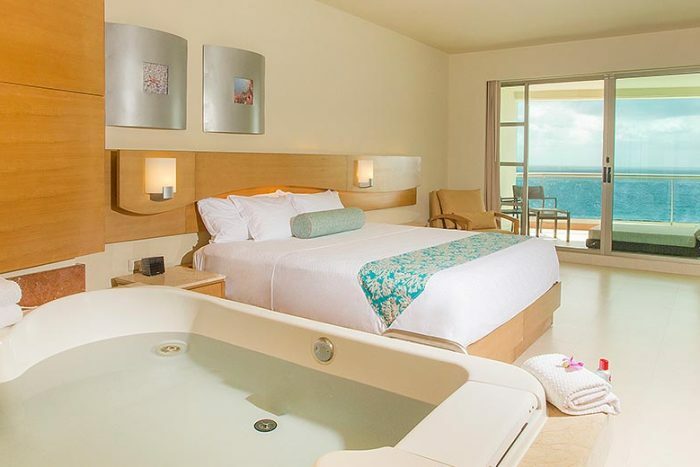 There are 287 total guest rooms with views of the lagoon or ocean. Handicap rooms and twin beds are available upon request. 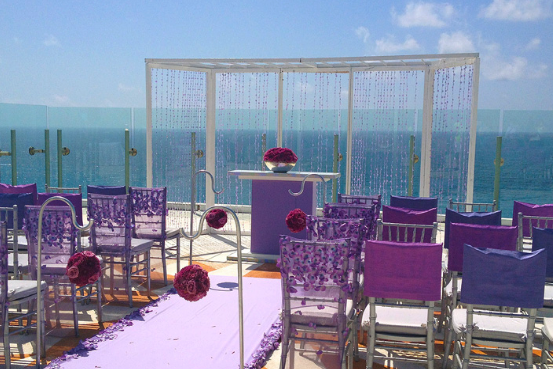 North Beach – unlimited guests, South Beach – unlimited guests, Sky Wedding Deck – 100 guests max. All rooms allow up to 2 adults and 2 children max. All rooms will allow a maximum of 1 infant (ages 0-3) to stay in the same room with 4 guests. The Family Connections Luxury Suite is only available to families traveling with children and will allow up to 6 guests max, with 4 adults maximum. There are adults-only rooms available with 2 adults max. Children are ages 4 – 17. The resort will host no more than 2 weddings per day Monday thru Saturday. Weddings can be held any time between 11am – 6pm, and no weddings will be held at the same time. High-season months typically include January, May, June, July, and December. It is always encouraged to have your guests book their stay 6 – 12 months in advance. The wedding coordinators typically respond within 24 – 48 hours. During the resort’s busy season, they may take longer. 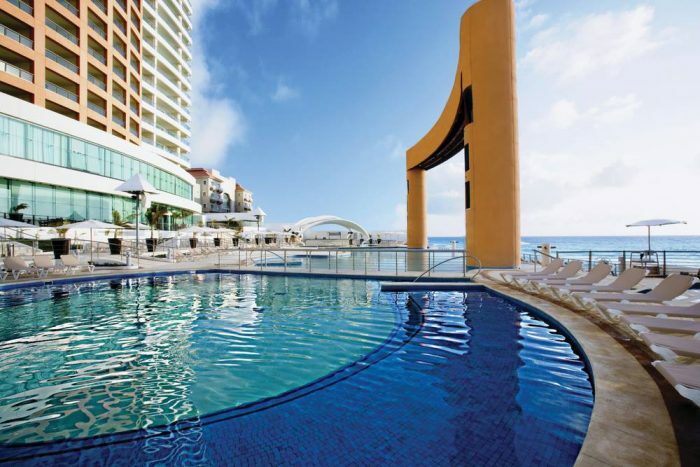 Beach Palace Cancun is located about 13 miles from the CUN airport. The resort is 25 minutes outside of downtown Cancun.